World’s age and die. But gods are immortal! What happens with a planet close to a god begins to slowly drift into illness? As we see in Thor: God of Thunder: The Last Days of Asgard, a caring god joins the environmental movement especially when it impresses the ladies. The earth is dying! Thor loves the Earth and is romantically interested in S.H.I.E.L.D. agent Roz Solomon who is leading the organization’s new environmental division. Thor and Solomon take a proactive step to destroy Roxxon plants polluting the Earth. But Roxxon does not take this standing down. Roxxon takes over Asgard’s Earthly home Broxton, Oklahoma. And Roxxon President Dario Agger makes it his personal mission to defeat Thor spiritually through his control of Broxton and physically as the Minotaur. The outcome of the “Siege on Broxton” changes Asgard’s standing within Midgard. Meanwhile in the future, King Thor and his granddaughters fight Galactus to preserve a deserted and scarred Earth after environmental collapse. Love is a really strong theme in this volume. There is the question of how Solomon and Thor feel for each other. Even Coulson quips that Solomon should call her boyfriend. But really the love seen in the story is Thor’s love of Earth. Thor has a special connection to Midgard. In today’s world he expresses this love by striking against pollution. He knows that worlds can die slowly. He recognizes that his beloved is slowly withering away. And being a bit of a smasher, he attacks Roxxon the best way he knows how, hitting stuff. Sadly for Thor, legal problems cannot be solved by hitting stuff! In the future he still cannot give up on the planet. Despite the fact that the Earth is spent, he still has no interest in letting Galactus make a meal of his favorite planet. Agent Coulson appears, often as the voice on the phone, supervising Solomon. And he appears just like we like to see him on Tuesday nights. Coulson is protective and serves as a mentor. He treats Solomon just like Skye or Simmons and Marvel Cinematic Universe fans will love the fact that Jason Aaron captures a key aspect of their Coulson. Agent Solomon is a new type of S.H.I.E.L.D. agent. She can use the gadgets and has been trained in spycraft. She is highly educated, as we would expect. But her target is not A.I.M. or Hydra. No, she is tasked to protect the environment from big business! That is a very different type of S.H.I.E.L.D. agent. Dario Agger is a villain that reflects Thor while also serving as a strong opposite. He is similar to Thor in being of the upper class. Agger sees himself as a god among men. He owns his own floating island, like Asgard. And the Minotaur aspect of him is violent and physical just like Thor. In contrast however, Agger understands weapons beyond fists as he employs money and lawyers to check Thor’s actions. Despite all his years on Earth, Thor really does not understand the legal system. Also Agger has no concerns for others. He will destroy the Earth to defeat Thor. Thor loves the people of Broxton and makes hard decisions to protect the average citizen. 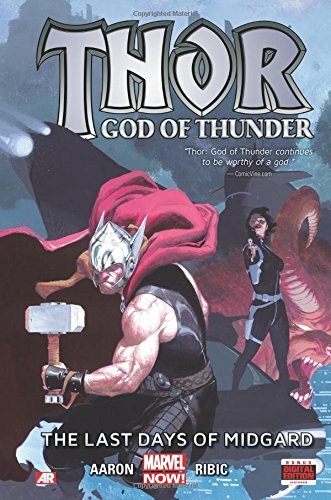 Thor: God of Thunder: The Last Days of Asgard by Jason Aaron with art by Esad Ribic paves the way for the next stages of Thor’s story, including Lady Thor. Asgard’s situation changes. Asgardian leadership changes hands. And as Thor’s granddaughters find a book wrapped in chains titled Unworthy, the reader prepares for a fall of godlike proportions.